I'm getting ready to get rid of some sewing machines. I have a Elgin 2468 sewing machine with a 15 class bobbin. The bobbin case looks pretty much like the one on my 15-91. The bobbin case has come apart again. I think I found how to put it back together online. Either that, or I kept messing with it until I finally got it back together. I am not sure which. I've searched online but just got hits for the whole bobbin case assembly. Any ideas on how it goes? Or a better search term? I've looked online for you about this matter but still have not found anything that will help. Perhaps you could take it to a sewing machine repair shop & they could show you how to re-assemble it. I'll keep looking. I looked it up, the Elgin 2468 was probably made by Husqvarna for the US marked. I can't reall wouch for it, but it looks worth the effort of a fixup. If it keeps coming appart I would rather have a new one, maybe there something that can be sorted out and make teh the latch stay on. The Archaic Arcane blog has a post on it. 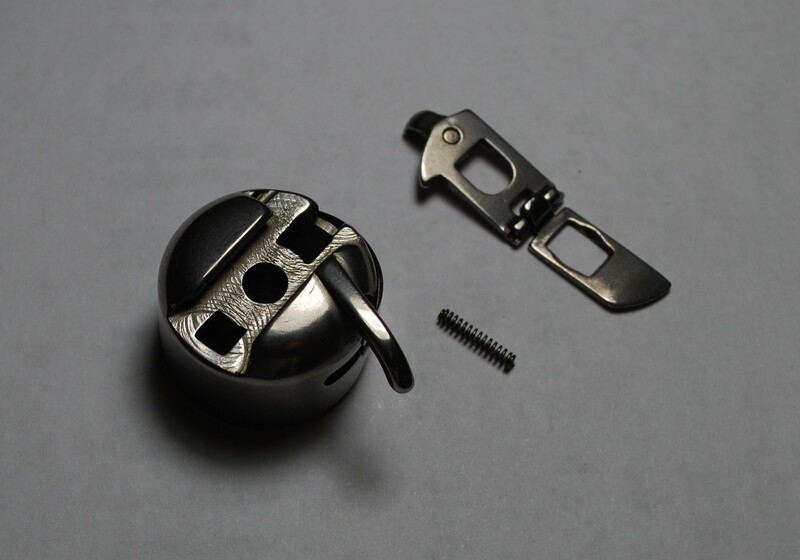 Replacement bobbin cases can be a fuzz, tiny production variations make a big difference from model to model, sometimes grooves, castings, edges etc needs to be grinded down or altered to work with a machine; or better order the right type. An old one for a Husqvarna CB-E might be identical. They do this in India too, very good visual illustration, but it's not in English. Apparently, 15 bobbin cases comes in endless variations. Last edited by Mickey2; 07-10-2018 at 04:26 PM. I looked it up, the Elgin 2468 was probably made by Husqvarna for the US marked. I can't reall wouch for it, but it looks worth the effort of a fixup. Mickey, I saw that video when I first bought the machine. That guy made up that Husqvarna stuff. The machine is Japanese made. It's embossed with "JC 27 JA 13 HI". White badged the same machine called surprisingly, White 2468. It's not one I want to keep. I need to get rid of about 8 sewing machines, almost all of them better than this one. There is something weird about the bobbin. It's really hard to change the bobbin. Somehow, it's really hard to get get it in and out. It's easier to raise the whole machine to change the bobbin than use the slide plate. Hopefully, I'll get the bobbin case back together and figure out how to keep it together. It's gone, even if I have to donate it. The spring goes in the side first. Then the tab goes into the slot with the bump covering the spring. The hinge is open. Then you push the hinge back as hard as you can. Then flip the hinge closed. If the next time you flip the tab, it falls apart again, then the hinge is bent and you won't be able to repair it. 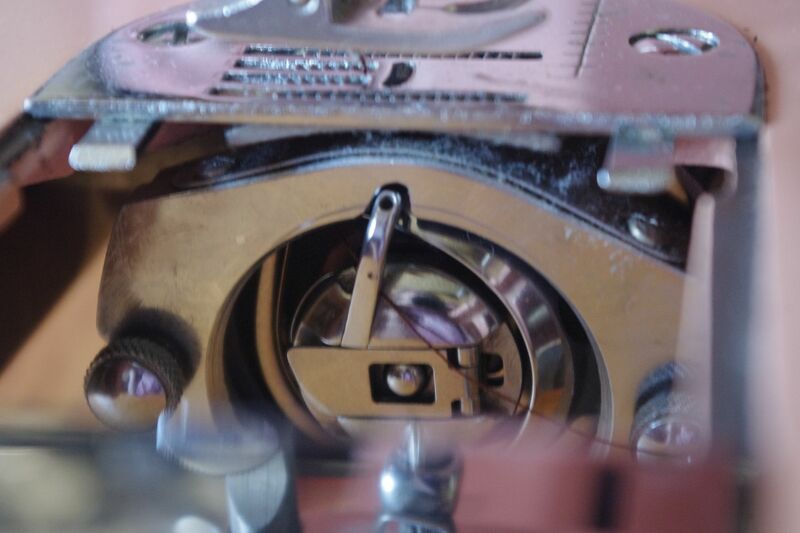 I believe the Kenmore JO1313 bobbin case would replace it very well. The retail for about $3.00. That is how I remember it. On the particular BC I worked on after everything was put in place a small screw was screwed into the finger tab from the bobbin side or back end. This kept the works from flying out. There is a anvil like BC holder that makes the screwdriving easier. 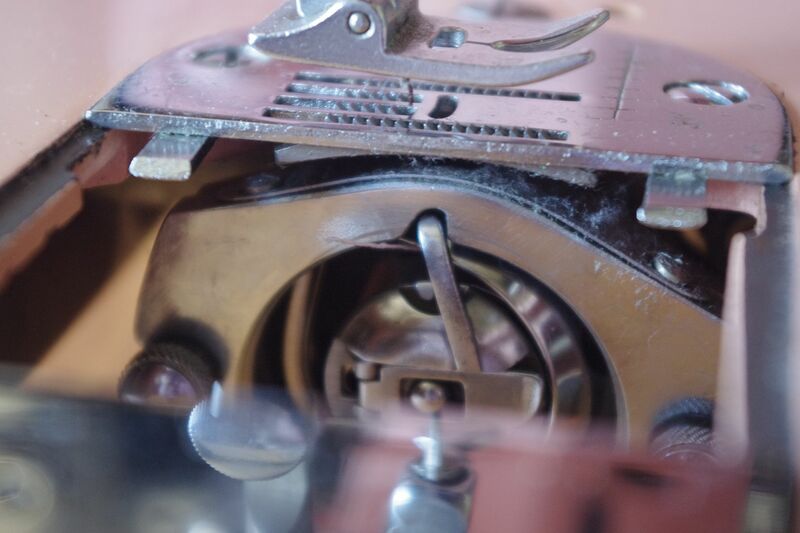 The bobbin case was for a Singer 95 and 96 industrial so construction might vary from Class 15. I see, there's a blog post mentioning the same, I guess misinformation is easily perpetuated on the web. It needs to be nipped in the bud. If the bobbin or bobbin case is hard to get in and out it might be a replacement case. As you well know, the tiny variations in production can result in behavior like that. It's hard to detect the difference unless you have the original bobbin case with the machine. An all metal model is worth a second look, but it has to be a good one. This is the second time this bobbin case has fallen apart. It's really not likely to stay together. I had not considered that I could replace the bobbin case so inexpensively as quiltedsunshine suggests. Besides the bobbin issue, the machine is a nice machine. It's a high shank, which I consider a disadvantage, but runs well and is fairly quiet. I've looked for the cams, but missed the only set I've seen come up on ebay in the last year. Would it hurt the bobbin case if I tried a Singer 15 case in it? (I don't have any spare bobbin cases for my 2 15-91s.) Besides the Singer, I have another couple of 15 class bobbin machines that might yield a working bobbin. At least then, I might know which one to buy. Insert whatever 15 case you have, gently turn the hand wheel, if everything turns smoothly and doesn't crash anything, do some test sewing. At this point you just have to test the ones you can get your hands on. The only CB cases I find too pricy is generally Bernina, and Berninas are very fuzzy with replacement parts. Bkay as long as the finger on the Singer bobbin case points in the right direction you can insert it and try it in straight stitch. If the Elgin is a front loading zigzag machine then don't try to zigzag with that case in it unless it also came out of a front loading zigzagger. If the Elgin is an end loader then it doesn't matter. What is the difference between end loader and front loader bobbin cases in this regard? I never though of that before. Come to think of it my 201 suddenly became a toploader lol. Most Singer cases will not work as the finger goes the wrong way. You can often times get them to fit though . . . This is a Singer case in a Japanese clone. And the same machine with the correct bobbin case. I got it back together. Thanks, Mickey. The Indian youtube video was the trick. Since my latch was in one hinged piece, it varied a little bit. I'm not sure that's the way I put it together last time, so maybe it will stay together this time. What I had to do was partially insert the tab, then insert the spring and finish inserting the tab. It went together really easily. It does have a little tiny screw in it that I will tighten. I'm going to do some demo stitches, so I should know if it's going to fall apart again before I sell it. I assume if it sews a straight stitch and a zigzag, then the bobbin case is correct. Then, if it falls apart, I will at least know what case I'm looking for. I just noticed his one has a J-HI on it. The machine is embossed on the bottom with an HI, in addition to JA and JC numbers, so this might be the right case.